Chamber Music at the Clark concert seating is determined via lottery. The booking-by-lottery entry form for American String Quartet concert seats posts here on Thursday, January 24, 2019. Lottery registration closes Thursday, February 14, 2019. Internationally recognized as one of the world’s finest quartets, the American String Quartet has spent decades honing the luxurious sound for which it is famous. The Quartet will celebrate its 45th anniversary in 2019. In its years of touring, the Quartet has performed in all 50 states and has appeared in the most important concert halls worldwide. The group’s presentations of the complete quartets of Beethoven, Schubert, Schoenberg, Bartók, and Mozart have won widespread critical acclaim. Their MusicMasters Complete Mozart String Quartets, performed on a matched quartet set of instruments by Stradivarius, is widely considered to have set the standard for this repertoire. The Quartet’s 2017–18 season featured a major project with the National Book Award-winning author Phil Klay and the poet Tom Sleigh. This groundbreaking program combined music and readings that examined the effects of war on people, their hearts, and their minds. In 2016–17, the Quartet collaborated with the renowned author Salman Rushdie to premiere a new work for narrator and quartet by the film composer Paul Cantelon built around Rushdie’s novel The Enchantress of Florence. The Quartet’s diverse activities have also included numerous international radio and television broadcasts, including a recent recording for the BBC; tours of Asia; and performances with the New York City Ballet, the Montreal Symphony, and the Philadelphia Orchestra. Recent highlights include performances of an all-sextet program with Roberto and Andrès Díaz, many tours of South America, and performances of the complete Beethoven cycle of string quartets at the Cervantes Festival in Mexico and the Tel Aviv Museum in Israel. The American’s extensive discography can be heard on the Albany, CRI, MusicMasters, Musical Heritage Society, Nonesuch, and RCA labels. Most recently the group released Schubert’s Echo, which pairs Schubert’s monumental last quartet with works bearing its influence by Second Viennese masters Alban Berg and Anton Webern. This repertoire posits that the creative line from the First to the Second Viennese Schools is continuous, and evident when these works are heard in common context. As champions of new music, the American has given numerous premieres, including George Tsontakis’s 2015 Quartet No. 7.5, “Maverick,” Richard Danielpour’s Quartet No. 4, and Curt Cacioppo’s a distant voice calling. The premiere of Robert Sirota’s American Pilgrimage took place in September 2016. In January 2009 the Quartet premièred Tobias Picker’s String Quartet No. 2 in New York City in celebration of the 90th anniversary of the Manhattan School of Music. 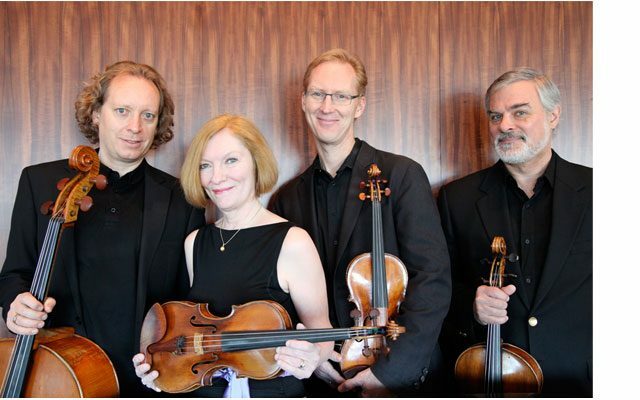 Formed when its original members were students at The Juilliard School, the American String Quartet’s career began with awards from both the Coleman Competition and the Naumburg Award in the same year. Resident quartet at the Aspen Music Festival since 1974 and at the Manhattan School of Music in New York since 1984, the American has also served as resident quartet at the Taos School of Music, the Peabody Conservatory, and the Van Cliburn International Piano Competition.